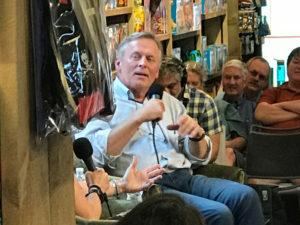 John Grisham’s new podcast, “Book Tour with John Grisham,” kicked off last week with an episode recorded in front of a live audience at Northshire Bookstore in Manchester, Vermont. 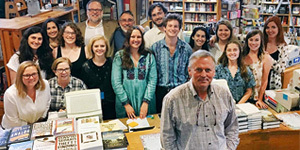 It was a sold-out event, with guests receiving a copy of Grisham’s new Doubleday novel, CAMINO ISLAND, which the author signed for many of the attendees. This podcast featured the store’s co-owner, Chris Morrow; Grisham’s longtime agent and editor, David Gernert; and fellow Penguin Random House author Jodi Picoult. To access the “Book Tour with John Grisham” podcasts via the Apple iTunes store, click here. Future podcast episodes will include such authors as Greg Iles, Harlan Coben, Ron Rash, Lisa Scottoline, Ann Patchett, Jon Meachem, Clyde Edgerton, and David Grann, as well as book reviewer Janet Maslin of the New York Times, recorded at such bookstores are RJ Julia in Madison, CT; Quail Ridge Books in Raleigh, NC; Malaprop’s in Asheville, NC; Square Books in Oxford, MS; Lemuri Books in Jackson, MS; and Politics & Prose in Washington, DC. 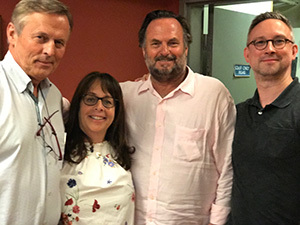 Below, at Northshire Bookstore, Grisham addresses a question, and is pictured with Doubleday’s Suzanne Herz, John Pitts, and Todd Doughty. Podcast spoiler alert: There’s a lot of dishing about bookselling, publishing, Hollywood, and the writing life, as well as fun interaction with the audience.